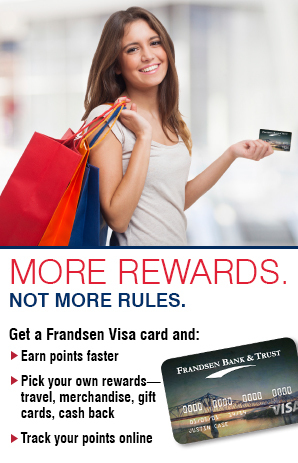 Frandsen Bank & Trust partners with businesses of all types and sizes: small businesses, regional companies, agri-businesses and everything in between. We offer core business banking products combined with technology and conveniences that make you more efficient. Products You Need: Our checking accounts, savings accounts and loan options are tailored to your business. Services You Expect: We offer merchant services, cash management and other options typically offered by larger banks. Convenience You Deserve: Complete transactions and check your accounts with services including Remote Deposit Capture, online banking, online bill pay, eStatements, credit cards, and telephone banking. Our experienced business bankers are ready to help.